if he’s related to me! IMAGE: Cover of Howard Stern’s 1993 autobiography Private Parts. NOTE FROM THE AUTHOR: Though I did a search for my first and last name, I already had a famous person in mind—Howard Stern, who was the source of the second most favored joke people made about my last name when I was growing up. 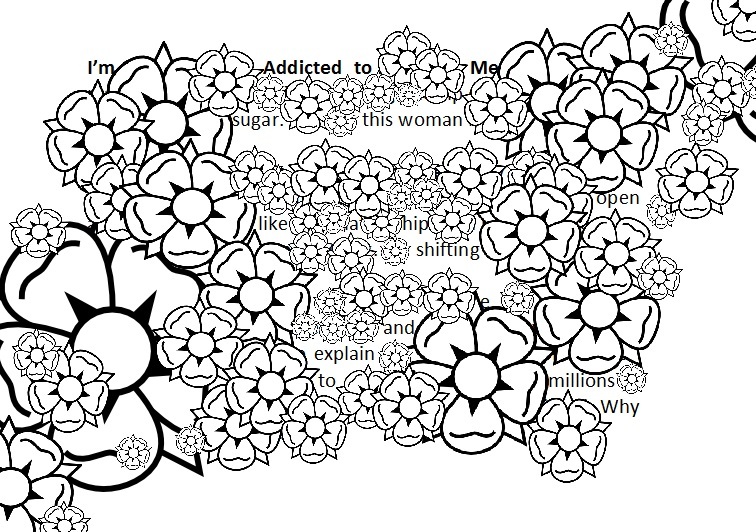 After a little research, I started writing the poem. While polishing the draft, it seemed to need a parenthetical aside, so I rewrote it to add in a few. Caitlin Stern grew up in San Antonio, Texas, where she read in trees, “published” her first book in elementary school, and had longhorns across the street from her middle school. Scorching summers and interesting juxtapositions inspired many poems and stories throughout the years. She followed her love of books to Angelo State University, where she worked as a tutor at her school’s Writing Center, and later as a Teaching Assistant while she earned an English MA. Recently, she has edited several novels for self-published authors, and had poems published in Silver Birch Press’ anthologies and online collections. 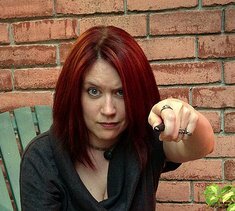 AUTHOR’S PHOTO CAPTION: Taken in a bookstore, December 2015. Because nothing says holidays like books! I don’t put on a show. There is no falsity in me. I don’t go in for half measures. I love being able to let myself go. I’m myself, and I let the wind take me. SOURCE: Freddie Mercury interview, The Guardian (Nov. 22, 2011).The piece first appeared in Melody Maker (December 1974). 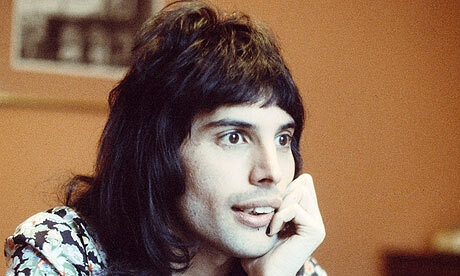 IMAGE: Freddie Mercury of Queen in 1974. Photograph by Michael Putland, ALL RIGHTS RESERVED. NOTE FROM THE AUTHOR: I’ve always been a huge admirer of the late, great Freddie Mercury. In this poem, I’ve allowed his own words to encapsulate my perception of him – a wonderful performer and a truly great free spirit. ABOUT THE AUTHOR: Sue Barnard is a novelist, an award-winning poet, and a member of the editorial team of Crooked Cat Publishing. She has a mind which is sufficiently warped as to be capable of compiling questions for BBC Radio 4’s fiendishly difficult Round Britain Quiz – an attribute which once caused one of her sons to describe her as “professionally weird.” She lives in Cheshire, UK, with her husband and a large collection of unfinished scribblings.To learn more, visit her blog. be taken into care like cranberries. and the metallic taste of spinach. men really like looks the same. SOURCE: Nigella Lawson interview by Becky Anderson, CNN (April 19, 2010). IMAGE: Celebrity chef Nigella Lawson. ABOUT THE AUTHOR: Andrea Janelle Dickens recently moved to the Sonoran Desert, where she lives among the sunshine and saguaro cacti. 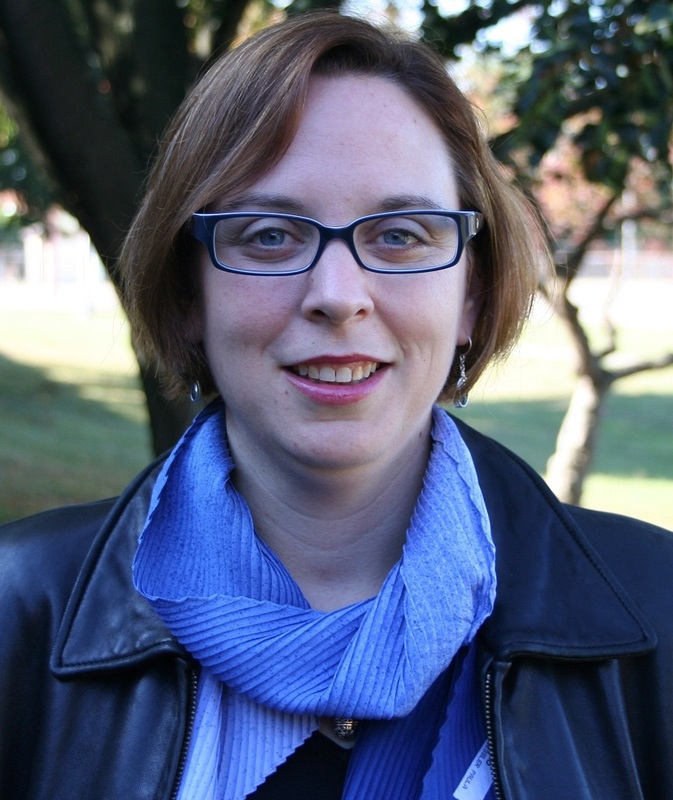 Her work has appeared in Star 82, cakestreet, Ruminate, Caesura, and The Wayfarer, among others. She teaches at Arizona State University, and when she’s not teaching, she’s backpacking in foreign cities, making pottery in her ceramics studio, or tending hives of bees. SOURCE: “Keeping Up With Kimye,” by Hamish Bowles, Vogue Magazine (April 2014). 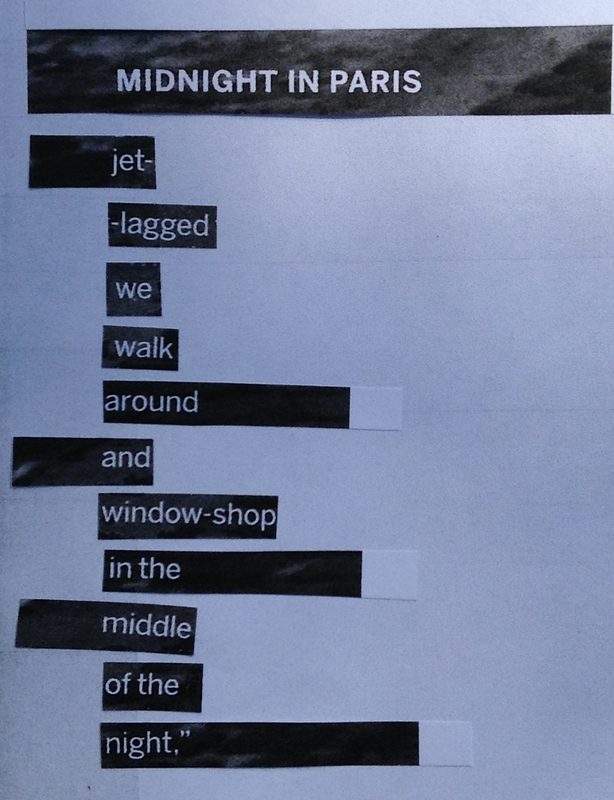 NOTE FROM THE AUTHOR: This is a found poem, using Kim Kardashian‘s quote alongside the photograph on page 220 (Vogue, April 2014). 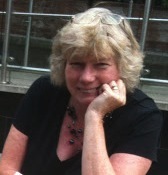 ABOUT THE AUTHOR: Karen Massey writes in Ottawa, Canada. She has an MA, has published one chapbook, and her work has won local and regional prizes and appeared in a range of literary journals and anthologies. Recent online publication includes Bywords.ca, and one of her poems was featured on the Chaudiere Press blog during National Poetry Month 2014. SOURCE: Kardashian Konfidential, page 136 (St. Martin’s Press, 2010). ABOUT THE AUTHOR: Wm. Todd King is a poet and Regulatory Compliance Supervisor living in Kentucky. He is the recent finalist in the Found Poetry Review’s Dog Ear Poetry Contest, and a participant in 2013’s Pulitzer Remix project. His works have appeared in STILL, the Silver Birch Press NOIR Erasure Poetry Anthology, Life’s Vivid Creations, and Found Poetry Review. and explain to millions why. 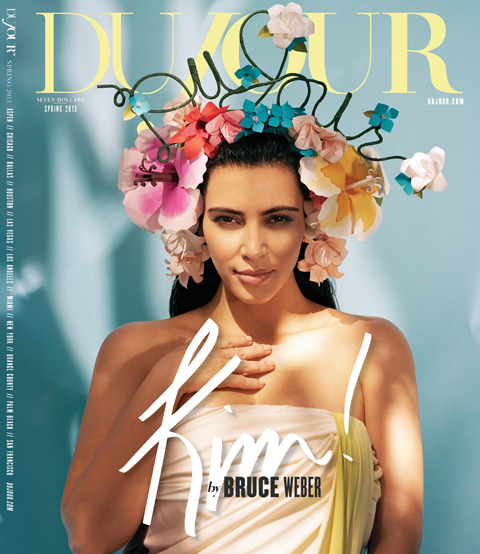 SOURCE: “Kim Kardashian: In Search of the K Factor” by Alyssa Giacobbe, DuJour Magazine (Spring 2013). PHOTO: Kim Kardashian by Bruce Weber, DuJuour Magazine (Spring 2013). 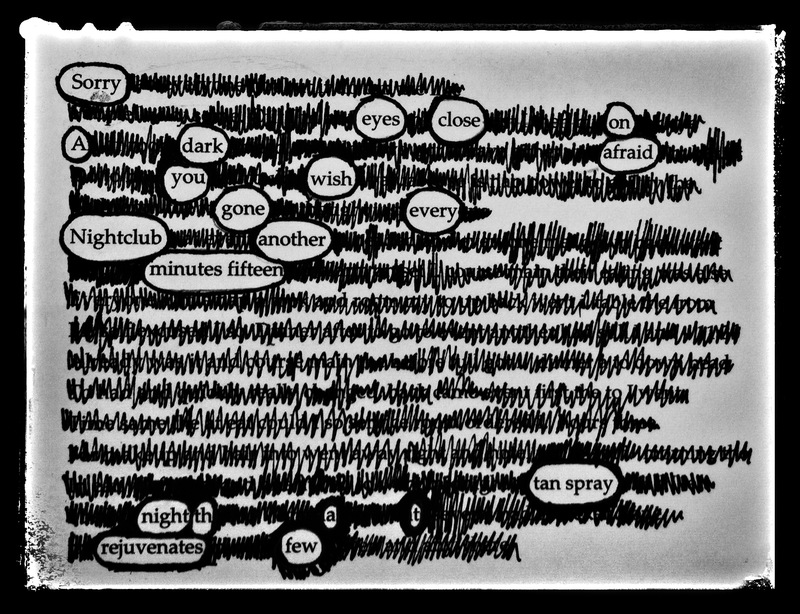 NOTE FROM THE AUTHOR: In this erasure I have tried to distil the found words of Kim Kardashian into something hopefully poetic. 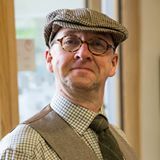 ABOUT THE AUTHOR: Teacher, compere, performer and poet, Winston Plowes spends his days fine-tuning background noise and rescuing discarded words. These are re-sculpted over a glass of wine into poetry birds he releases by night to fly to new homes in poetry journals and online destinations worldwide. He lives in a floating home in Hebden Bridge, West Yorkshire, UK, where he tries to persuade his two black cats that it’s a good idea for them to do the same. Visit him at winstonplowes.co.uk. I go with my gut instinct. I’ll admit it: I’m a control freak. I customized my school uniforms. I had Post-Its on all the breakfast cereal. I can live with my own mistakes. But I’ve finally made the transition. I’m a gay man in a woman’s body. SOURCE: Victoria Beckham interview in Marie Claire (October 2010). IMAGE: Singer/fashion designer Victoria Beckham. reduced to writing about writers. Are you a Sadist? Do you have courage? SOURCE: Martin Amis interview on ABC-TV in Australia (2/26/14). 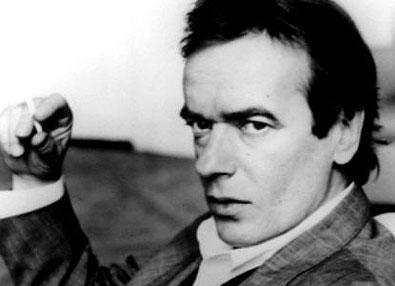 IMAGE: Author Martin Amis (BBC photo). NOTE FROM THE AUTHOR: I tried to pick out lines that not only sounded poetic and had some atmosphere to them but also related to things that I, and I’m sure sure quite a lot of other people, associate with our Martin. Things like the strange kind of fame that can only be achieved by a cult author, his father, narcissism, wanting to “beat” mortality, sexism, whether or not people have the right to complain or be offended by literature or art (even if it’s misogynistic) and fiction vs. reality as an entire concept. I have added nothing to these lines, I have not even changed the order. This is all Martin, baby. ABOUT THE AUTHOR: Twenty-three years old and hailing from Manchester, UK, Stephen James has been writing for a long time and has a blog but is relatively new to doing so publicly and performing his work. Over the last six months or so, however, he has jumped right in there. 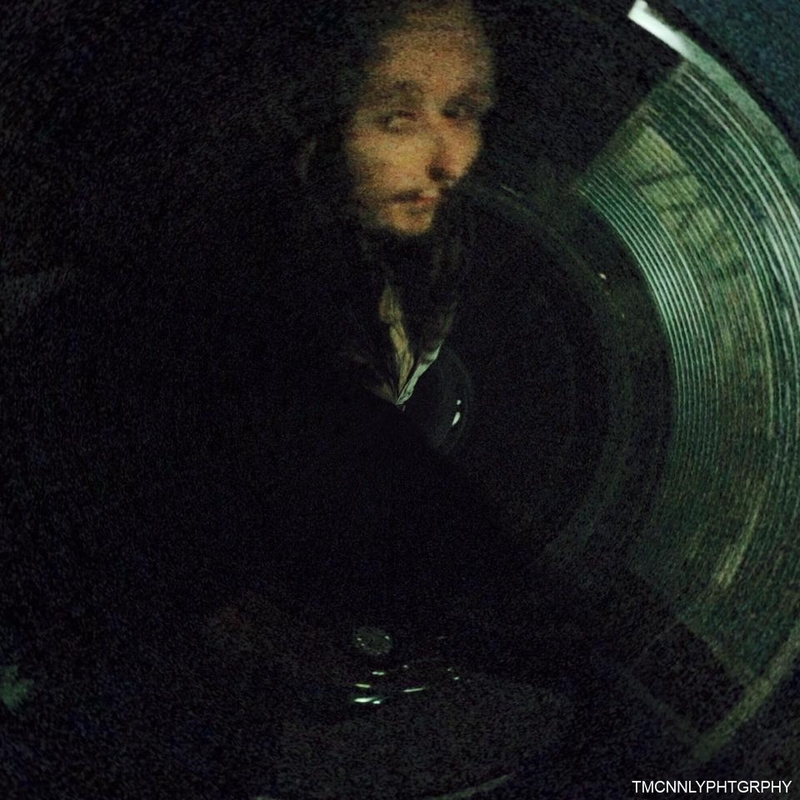 He has self-published a book of poems and several pamphlets containing short fiction(ish) and has guested at several events and made himself a regular at numerous open mic nights. He even ranked last in a poetry slam. He also hosts his own Spoken Word Showcase, which is definitely not a competition. He is a strong believer in poetry as self-expression, and self-expression is something that you cannot do wrong or better or worse than somebody else. He urges everybody to put pen to paper. It is immensely satisfying. 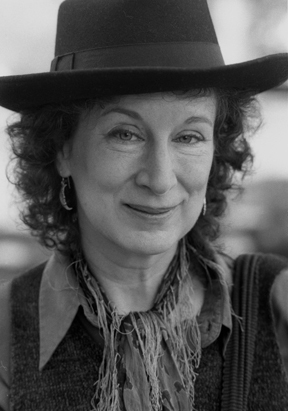 SOURCE: Margaret Atwood interview by Deborah Rozen (1997) posted on a Random House Blog <bold type>. 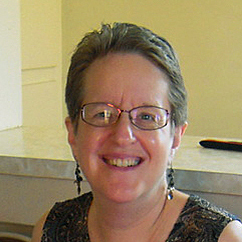 ABOUT THE AUTHOR: Susan Beem is a retired family physician who lives in Long Beach, California, and has been writing poetry for about 10 years with the help of local workshops. Her poems have been published by Verdad, Ekphrasis, Turtle Quarterly, Song of the San Joaquin, Bank Heavy Press, Medusa’s Laugh, and included in several themed anthologies.